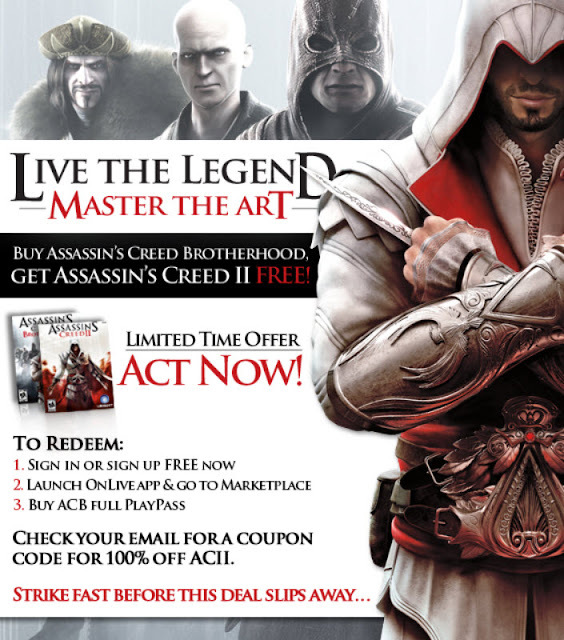 OnLive is running a deal that will please those who love the Assassin's Creed series. When you purchase Assassin's Creed Brotherhood on OnLive, you will get Assassin's Creed II for free in the form of a coupon code emailed to you. This offer is valid till July 31, at 11:59PM PDT. Hopefully OnLive will also bring the first Assassin's Creed game in the series to it's service, it would make a nice addition to the PlayPack. Gue kangen putting D3 Goldup raft bulan maret The year 2008 kemaren, hampir tiap 1-2 hari gue publishing, rasanya banyaaak banget yang bisa gue ceritain waktu itu. Sekarang Guild Wars 2 Goldjuga sih, tapi waktunya aja yang kurang buat gue nulis! It's a good deal better ones compared to plastic-type material ones with retailers on Günstige android-Smartphones ohne Vertrag online bestellen a regular basis.